It starts at the mounting block. Really. If you are still proving your testosterone (yes, you heard me) by ground mounting, give your horse and his withers a break. Go to the mounting block. Do it for him. Once you are at the mounting block, take a minute and ask his permission by acknowledging him with a scratch and a kind word. Counter balance your weight between the stirrup and his off side, and come gently into the saddle. Exhale and give him a soft stroke on his neck. Park there and scan your body for stiffness or tension. Take your time; inflate the corners of your lungs, breathe deep to your sit bones. Let gravity soften your shoulder blades down your back. Breathe all the way to your soft ankles and warm fingernails. Yes, even in January. His walk begins with your seat. So with an inhale and maybe a light calf squeeze, ask your horse to walk on. Engage your sit bones and follow the movement of his back. Be alive, don’t sit there like a cinder-block, but instead, let the movement of his steps release and massage your lower back. As your back loosens, then his back can loosen more, and then the mutual massage begins. Dressage rhymes with massage for a reason. When his top-line has relaxed, reverse to the inside: Walk a half circle and then a diagonal line back to the rail. As he walks that half circle, turn from your waist and not the rein. His ribs expand and stretch on the outside and contract on the inside of the circle. Do another reverse and release the ribs on the other side too. Repeat. Have you noticed I haven’t mentioned picking up the reins yet? Exactly. Walk like you have some place to be. A ground covering walk is a 4 beat gait, relaxed and forward. Feel your horse’s back grow supple as he steps under, and his poll and neck should nod up and down with the rhythm of the walk. From the tip of his nose to the bang of his tail, nothing but fluid swinging movement. With just your sit bones, ask for longer steps, and say thank you. Then smaller steps, and again, thank you. Reward him for taking a sweet, small cue. If he only took a tiny bit of the cue, reward him even more, so that he will want to try more. Eventually, when you finally pick up the reins, be very aware of his poll softly nodding. You must follow with your hands, by letting your elbows be elastic so that his neck is not shortened by hitting the bit. If your hands inhibit the poll, your walk will lose rhythm. Practice free walk on a long rein, transition to a working walk on contact, shortening the reins without shortening his stride, and then back to a long rein. If his poll is level or lower than his withers, it’s correct for warm up and his back is getting stronger. The walk teaches your horse to relax and stretch his back, which in turn, improves all other work. Practice inside leg to outside rein on arcs and circles. Pulse your inside calf as your horse’s barrel swings to the outside. Cue in rhythm with his barrel. Walk a box: A quarter turn on the hind where there are cross over steps in front and the hind (yours and his) remains active. 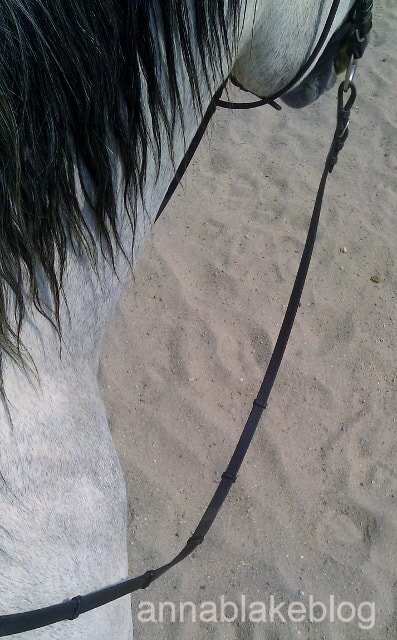 Turn at your waist to engage his shoulder and use outside rein/leg aid and no inside rein pull. Balance and bend improves by walking a serpentine or figure 8, with a fluid change of bend, not disturbing your horse’s head as you change rein. Sometimes use a neck ring and remind yourself to ride with your body and not all hand. All lateral movement starts at the walk. Leg-yield to start with a supple bend and rhythmic cues. If you lose forward, release and start back at the beginning. Then crank up the music, let Sinatra croon Dancing Cheek to Cheek, and get lost in the walk. And truly, I can’t be the only one who liked the slow dance best, am I? I forget which dressage master — you probably know, Anna — demanded that his students perform every maneuver at a walk for an entire year before he allowed them to proceed to a trot. He, too, maintained that all movements became more correct and easier to perform if first mastered at the walk. Sandra, it’s also what T’ai Chi masters know. Love the slow. It’s where all the postural muscles are developed, during slow maneuvers and holding positions. Those tiny muscles are more responsible for the way we move, carry ourselves and maintain balance than the large muscles groups responsible for speed, power and propulsion. Thank you for this comment, interesting information. I confess. I love to GO. So does my horse, but my favorite gait is the walk. It’s where we connect. I discovered by accident his big loose free-walk perfectly matches the beat of “I’m Yours” by Jason Miraz. A cheerful, happy, committed song. Perfect. Great post! Sierra and Ebony are a fun, opposite pair! I agree. Get on quietly. Take a breath. Relax. Walk out. My new horse was trained to go only one speed at each gait. No half-halts, shortening or lengthening. We have a lot of walking to do. I’m looking forward to it. Love it! I look forward to being more intentional with my horse at the walk! My first dressage instructor taught me to use the walk as a foundation for more advanced work. Decades later, it is still the basis of my training. Slow, mindful movement allows time to observe and sense differences. Instead of just “doing,” reducing effort gives us the opportunity to explore and become curious allowing us to stay present at the moment. Top athletes, such as, Ben Hogan (golf) and Monica Seles (tennis) used slow movement to uncover more efficient ways to move for greater power. Thanks for your comment, and yes, we train at the walk so that the learning can be felt, kinetically. I think it is the same for all athletes and it is certainly what T’ai Chi is all about. Good for you.